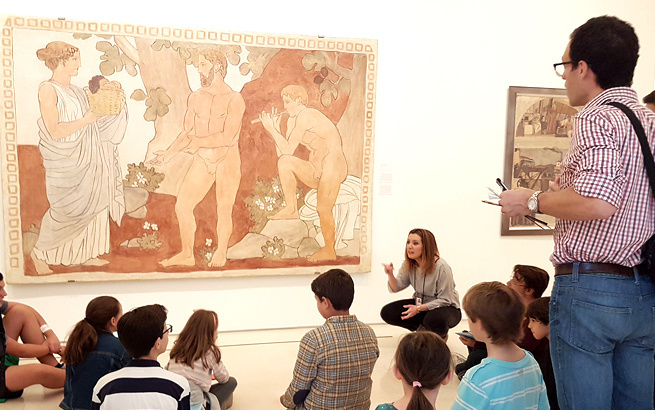 To coincide with the closure of the exhibition Joaquín Torres-García: The Arcadian Modern, Museo Picasso Málaga devoted a whole morning to getting to know about the Uruguayan artist, whose work defies classification or stereotypes. The activities for families and adults offered different approaches to the artist’s work. Cork, ropes and POSCA markers served families to build figures and turn them into modular toys. Shapes could be exchanged as they will be joined with metal binders. No prior registration required. Families could build a collective mural by designing pictograms on magnetic panels which will be arranged on metal structures. No prior registration required. Children and parents picked up postcards which took them on a “trip” through the temporary exhibition looking for answers to the questions written on them. At the end of their trip they returned to gallery XII to design an illustration for the front of the postcard. No prior registration required. A look into the works of artist Joaquín Torres-García that range from his earliest ones in late 19th-century Barcelona to his final works in Montevideo in the 1940s. The tour allowed visitors to delve into those links between Picasso and Torres Garcia’s life and works with various documents and publications on display in the museum galleries. Registration at the ticket desk from one hour before the start of the tour. A fun family book for the exhibition devoted to the Uruguayan artist will be available at the museum ticket office.